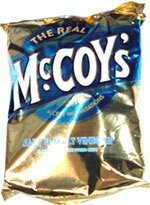 Taste test: McCoy's chips are the crunchiest, thickest ripple chips I've ever eaten. These have a medium level of vinegar flavor — noticeably less than your average vinegar chip, but still a very good taste. If you put them on your tongue, you'll get a little more zing. Smell test: Good, rich vinegary aroma.